Our friend Camp Bosworth makes incredibly, incredibly beautiful furniture, sculpture, paintings, etc…. You may remember him from the cheeseboards. 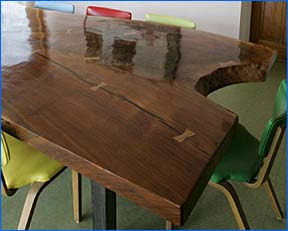 This is my dream table. Period. yes i'd be over for dinner in a flash! oh i meant, of course to see you, the table would just be a bonus! i should think before i comment, blah. now stop distracting me joslyn, i'm trying to work here. Wow. Life would be sooo much better with this table.